The Florida Keys has always been a sailor’s getaway and Key Largo is becoming a sailor’s dream destination. Key Largo is the uppermost key in the long chain of islands off the coast of Florida. With one of the best coral reefs, Molasses Reef, just three miles offshore of its south end, this key is one you don’t want to just merely drive through on your way down to the tourist trap at the end of the rainbow. Any local will tell you Key Largo is a must-experience staple of the Florida Keys. For those wanting to experience the epitome of the Keys-y, low-key sailor lifestyle the Key Lime Sailing Club and its many offshoots around the upper keys is the place to go. Key Lime Sailing Club down in Key Largo is where sailors take a break from living aboard their boats to enjoy each other’s company and the warm beach breezes over a cool drink and a beautiful sunset. The Club is family-owned and sail-oriented. There is a plethora of free water toys for anyone staying at the Club to use at leisure. These include kayaks, paddle boards, snorkel gear, canoes, and fishing gear. All right there on the beach because the cottages are so secluded the nature of it creates an environment of trust and community among the vacationers. Everyone gets to know each other on the beach and at the water side Tiki hut. The Sailing Club is also partnered with Morning Star Sailing Charters. Morning Star has been around Key Largo for over 30 years and is an important part of Key Largo. They have captained sunset sails and snorkel trips 7 days a week besides chartering their sailboats. A sailboat marina was also added to the Sailing Club in February of 2017, the South Dade Marina where there is also offered eco-friendly kayak tours through the mangroves. In fact, the marina has taken on a community vibe. At the marina there are Kayak rentals and tours with both clear and traditional kayaks, as well as sailboat bareboat charters, captained sunset sails (we love our sunsets, if you can’t tell by now!) on a 34’ Gemini Catamaran with an 18″ shoal draft, 4 hour charters with one or two activities available, everglades kayaking tours, mangrove jungle adventure snorkeling, beach barbecues, and a 10 to 11 hr 32 mile round trip sail out into the ocean for a snorkel turtle reef tour. Other boats available are a 33′ Morgan Islander, 24′ Hunter and a few Catalina 22’s. Attached to the Club is, of course, an ASA accredited sailing school. The American Sailing Academy has locations both in the South Dade Marina and the Key Lime Sailing Club. 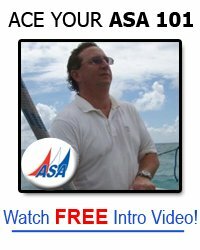 They offer classes from the ASA 101 Basic Keelboat Sailing Certification to the ASA 106 Advanced Coastal Cruising, all the way up to the 116. The captains down at the Club even have the qualifications to teach the ASA 107, Celestial Navigation Certification (if you ever want to forgo the modern marvel of your GPS). And if you are thinking of wanting to teach yourself (become an ASA instructor), you can get certified down here as well! Vacation is a great opportunity to finally get those certificates out of the way and encourage your kids to learn how to sail on their own. But one of the most convenient things about the Club is when you book a stay in one of the many seafarer-themed cottages you get a personal 22 Catalina to cruise around in for your whole stay. Imagine yourself taking out this no-stress small vessel out to Nest Key, what we like to call Mud Bath Island and spending the day there with an ice chest full of drinks and food. Key Largo has a lot to offer all your vacation dreams and the Key Lime Sailing Club has been slowly focusing the key into a top sailing destination while supporting and maintaining important historic areas of Key Largo and cultivating environmental awareness among vacationers and locals alike. Whether you come here to learn, relax, or explore new experiences, the Club has what you need, when you need it. 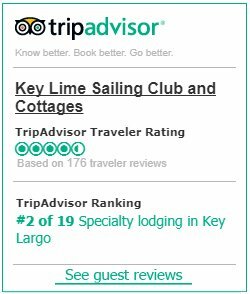 Easy to reach and hard to forget: Key Lime Sailing Club and Cottages.